lie (heavy) on one's stomach 〈食べ物が〉胃にもたれる. on a full [an empty] stomach 満腹[空腹]で. The sight turned my stomach. その光景には吐き気を催した. 可算名詞 腹部，腹; (突き出た)下腹 (⇒body 1 さし絵). have a pain in the stomach 腹が痛む. He lay at full length on [upon] his stomach. 彼は長々と腹ばいに寝そべっていた. I've no stomach for anything sweet now. 今は甘いものは食べたくない. I have no [don't have the] stomach for a fight. けんかをする気はない. I cannot stomach sweets. 甘いものは食べられない. Who could stomach such insults? だれがこんな侮辱に耐えられようか. He has a strong stomach. Too much coffee will upset your stomach. Do you have a pain in your stomach? I have no stomach for sweets . I can't stomach such an insult. It's not a good idea to drink (= alcohol) on an empty stomach (= without having eaten anything). From Middle English stomak, from Old French estomac, from Latin stomachus, from Ancient Greek στόμαχος (stómakhos), from στόμα (stóma, “mouth”). Displaced native Middle English mawe (“stomach, maw”) (from 古期英語 maga), 古期英語 bouk, buc (“belly, stomach”) (from 古期英語 buc (“belly, stomach”), see bucket). 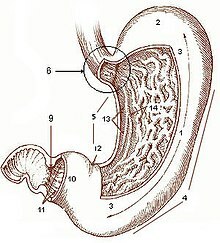 An organ in animals that stores food in the process of digestion. Sterne was his looke, and full of stomacke vaine, / His portaunce terrible, and stature tall […]. You come not home because you have no stomach. / You have no stomach, having broke your fast. HOST. How say you sir, doo you please to sit downe? EUMENIDES. Hostes I thanke you, I haue no great stomack. If after seven hours' tarrying he shall have no stomach, let him defer his meal, or eat very little at his ordinary time of repast. (figuratively) Desire, appetite (for something abstract). I have no stomach for a fight today. (transitive) To tolerate (something), emotionally, physically, or mentally; to stand or handle something. I really can’t stomach jobs involving that much paperwork, but some people seem to tolerate them. I can't stomach her cooking. (obsolete, intransitive) To be angry. (obsolete, transitive) To resent; to remember with anger; to dislike. O, my good lord, / Believe not all; or, if you must believe, / Stomach not all. The Parliament sit in that body […] to be his counsellors and dictators, though he stomach it.